I am super excited about the Let’s Eat Cake Fundraiser tonight! I have probably worked over 200 hours on my cake in the last 3 weeks so I’m ready for it to make its debut! The title of my cake is Romantic Escape, and it’s meant to represent the moments during a wedding celebration that the bride and groom “escape” from reality and are only aware of each other. I have heard people say that, when entering a competition, you shouldn’t try to please the judges or the public – only yourself. If you make yourself happy, that’s the best you can do. I am a firm believer in that theory! I can’t control what others think about my cake, but at the end of the day, I’m proud of it! This cake was far from easy, and I tried many “firsts” on it, including the gum paste tulips, the huge gum paste ribbon and bow, the gum paste bride and groom, and the bridgeless stringwork on the top tier. In fact, to show you that I hit many hurdles, here is the first groom I attempted to make. He’s fat and stumpy! 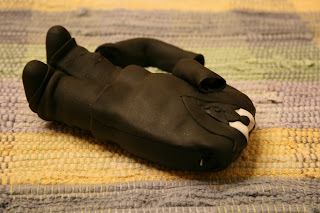 After making this groom, I learned that you have to form his legs and torso, let them dry, and THEN assemble them! 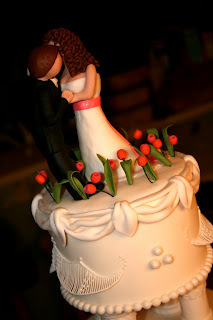 To make the bride and groom on this cake, I formed the bodies with gum paste and allowed them to dry for several days. Then, I dressed them, little by little, allowing things to dry before I added too much more. It’s a slow process but I’m much happier with the results. I mean, would you want to see this guy on your wedding cake? I hated him so much I didn’t even give him a head or fix his broken arm! Haha! 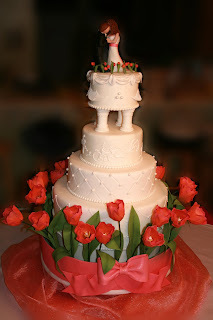 The gum paste bride and groom embraced/danced (depending on your interpretation) atop the cake in a field of gum paste tulips. Wires should never be inserted directly into a cake, even during cake decorating contests in which fake cakes are used. To avoid getting points knocked off, I made a fondant plaque to sit on top of the cake. The wires from the leaves and flowers were inserted into this plaque so that they didn’t disturb the cake underneath. Stringwork is often revered as a technique that only master decorators can perfect. I disagree! With patience, a steady hand, and a little bit of knowledge, anyone can do it! If you’ll recall, I put stringwork on my swan cake that I took to the ICES Convention last summer. 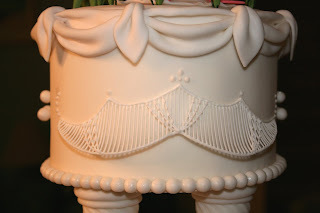 The stringwork I did here is different in that there is no “bridge” under it, meaning the bottom of the stringwork is not connected to the cake! 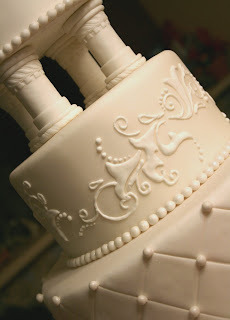 Bridgeless stringwork gives the impression that the icing is defying gravity and it’s very awe-inspiring! I searched high and low for a tutorial on how to do bridgeless stringwork and finally emailed the Florida ICES Representative, who finally gave me the answers I needed! I’ll make a post in the future on how to do both types of stringwork. I came across a whimsical tulip design in one of my cake decorating magazines and recreated it with royal icing on one of the tiers. I also came across some instructions for how to make traditional-looking columns. Sure, you can buy clear or white columns from the store…but they look like plastic (because they are)! Making the columns added an additional skill to my cake. To make these tulips, I loosely followed Nicholas Lodge’s directions as well as Pam’s, another decorator from Ocala, advice. I made my own cutter to create the petals and adjusted it to be what I considered life-like. 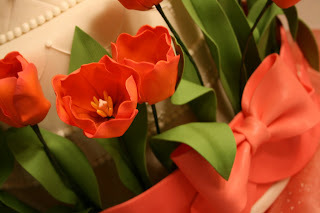 Tulips are one of my favorite flowers so I used this cake as an excuse to buy lots of them! I could have bought the stamen and pistols, but I thought it would add yet another skill to the cake if I made them from hand. Of course, that added even MORE time to the whole process. 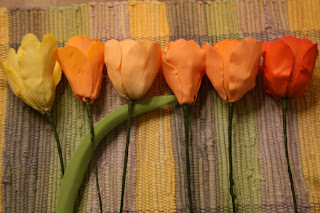 I’ll make a post about how to make the tulips – check back later! Wow! Those tulips look SO real! Congratulations, I heard you won! Wow! That’s amazing! Did you really win? I wouldn’t be suprised!